Some movies deserve sequels. Others do not. Bridget Jones's Diary was a wonderful romantic comedy that made a killing at the box office. Rather than leave well enough alone, here is Bridget Jones: The Edge of Reason, based on the novel by Helen Fielding. There is a huge problem here. This movie is bad. The original Bridget Jones was funny because while it mocked nearly every element of the main character, placing her in as many embarrassing situations as possible, it did so in a funny and clever way. Like many sequels, The Edge of Reason opts to keep the status quo. Because embarrassing Renee Zellweger worked in the original, the sequel does so many times more. The difference here is that there is nothing clever about this film. There is no reason for this sequel, and everybody involved seems to recognize this, because the story flounders in random directions, trying to latch onto something concrete. Things pick up nearly directly after the original, with Bridget (Zellweger, Shark Tale, Cold Mountain) happily dating Mark Darcy (Colin Firth, Love Actually, Girl with a Pearl Earring) and merrily shagging him. But since Bridget is highly neurotic, she cannot recognize a good thing when she sees one. She is still hypersensitive about her weight, and thinks that Mark is seeing his attractive coworker Rebecca (Jacinda Barret, Ladder 49, The Human Stain) behind her back. She is already thinking about marriage, even though she and Darcy's relationship is less than two months old. Worse, Daniel Cleaver (Hugh Grant, Love Actually, Two Weeks Notice) reappears, working at the same television station that Bridget works at. Daniel is still interested, but Bridget wants nothing to do with him. Grant and Firth are great, they just have nothing to do. The script is unknowingly harsh on Zellweger, who has to suffer through all sorts of indignities. Because there is no humor, this film is essentially a non-stop parade of Zellweger whining, embarrassing things happening to her, and Zellweger whining about these things. Fielding, Andrew Davies (Bridget Jones's Diary, The Tailor of Panama), Richard Curtis (Love Actually, Bridget Jones's Diary), and Adam Brooks (Wimbledon, The Invisible Circus) create a limp script. Since there is nothing left in London, they ship the cast off for a short ski trip, then off to a really bizarre interlude in Bangkok. The premise is that Daniel hosts a series of travelogues, and Bridget is to be his co-host. 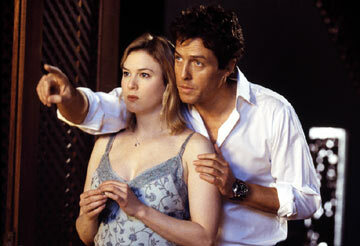 Because Bridget's incessant neuroses drove her away from Mark, the trip to Bangkok gives the movie the opportunity to create a triangle with Daniel. Unfortunately, a stupid twist about drugs lands Bridget in jail, turning The Edge of Reason into Brokedown Palace. The entire sequence is just strange. Director Beeban Kidron (Swept from the Sea, To Wong Foo, Thanks for Everything! Julie Newmar) limply directs Zellweger trying to teach her fellow inmates the correct words to "Like a Virgin." It's even worse than it sounds. The story eventually goes back to London, and ends the way everybody expects it to, which is endemic with the rest of the film. Everything is so calculated to imitate the original and to try to get laughs instead of trying something new. The original Bridget Jones's Diary was great fun. Go and rent it instead of watching this dreck. 1 hour, 48 minutes, Rated R for language and some sexual content.